The Congressional Budget Office (CBO) has released its 2019 budget and economic projections, and the budget outlook is very bleak. 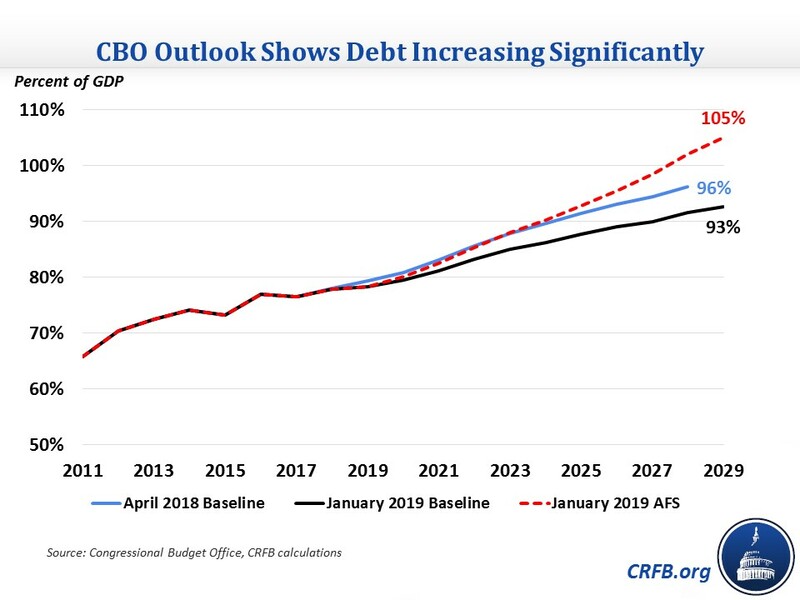 CBO's baseline shows debt and deficits rising significantly over the next decade, a trend that shows no signs of stopping over the longer term either. Under CBO's current law projections, trillion-dollar deficits will return in 2022 and grow to a record-high $1.44 trillion, or 4.8 percent of Gross Domestic Product (GDP), by 2028. Debt held by the public would grow from 78 percent of GDP in 2018 to 93 percent of GDP ($28.7 trillion) by 2029, the highest total as a share of GDP since 1947. Even these projections may be optimistic, since they assume that several temporary tax cuts and spending increases will expire over the course of the next decade. CBO produces an Alternative Fiscal Scenario (AFS), which assumes the extension of various tax and spending provisions that would cost $3.8 trillion through 2029. Under this scenario, the deficit would reach $2.2 trillion (7.1 percent of GDP) by 2029, and debt would reach 105 percent of GDP ($32.6 trillion), the second-highest total in U.S. history. CBO's projections are actually a slight improvement on the previous ones they issued in April of last year. That outlook showed debt reaching 96 percent of GDP in 2028, compared to 92 percent in the current outlook. However, the majority of the $1.2 trillion improvement in 2019-2028 deficits comes from the removal of a large amount of 2018 disaster relief spending that CBO had extrapolated into future years. Since lawmakers appropriated much less spending for 2019, that produces $686 billion of ten-year savings on paper, even though this didn't reflect any policy change. Other legislative changes slightly increase ten-year deficits. Otherwise, economic and technical changes combined reduce 2019-2028 deficits by $451 billion. Changes to economic projections reduce deficits by $336 billion, largely due to lower interest rates that lower debt service, while technical changes lower deficits by $115 billion, largely due to lower mandatory spending and $377 billion of tariff revenue but offset by lower revenue from other sources. Source: Congressional Budget Office. All numbers include debt service. Today's report shows a very bleak fiscal outlook, with deficits and debt expected to rise nearly continuously to very high levels by historical standards. Rather than thinking of ways to further increase deficits, as they have in recent years, policymakers should concern themselves more with digging out of this budgetary hole. Check our website later today for a full-length analysis of CBO's budget and economic outlook.